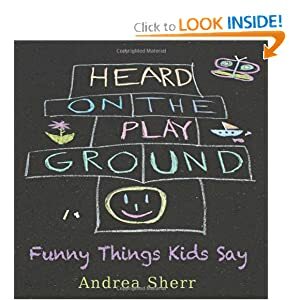 I’m excited to share that Mommy’s Memorandum and the kiddos have an appearance in the book Heard On The Playground Funny Things Kids Say. While reviewing colors with my daughter she confessed, “Mom, sometimes I forget what color grey is, then I remember it’s the color I see when you lift up your bangs”. But it’s not just my kiddos and their witty comments, it’s kiddos from all over the country. There are some hilarious moments all captured and bound with love into this book. It would make a great gift for Moms, Dads, Grandparents, Teacher and Friends this holiday season. Give it to anyone who likes to laugh! Currently, Heard on the Playground is being carried in children’s boutiques, gift shops, and high end stationary stores. Larger chain stores are considering it for distribution as well. The book is also available on Amazon.com. A great idea for a book, looks very funny!